Knowledge on the Internet – that’s what Rexroth has been working on by setting up its Knowledge Portal. 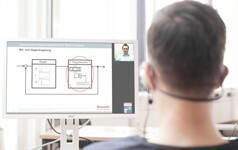 In addition to the topics from the existing Rexroth LearnWorld, the portal will develop into a multimedia contact point of everything in the area of drive, control and motion technology. The aim is for it to be the central element of our professional and college training in the future. It gives users unique access to practical knowledge transfer, learning tools and media. Community and Wiki functions enable structured sharing of knowledge and experience for the first time – all can be accessed from a single source. You will understand complex systems in industrial technology with training sessions which will give you all the basics and advanced knowledge in hydraulics, pneumatics, electric drives and controls, mobile applications, linear motion technology, automation and mechatronics. All aspects of drive, control and motion technology over the Internet at any time. A voluntary knowledge check per training allows you to determine the knowledge level and ensures that the selected training corresponds to your target expectations. Our unique contact point will offer the user access to high-quality information and structured exchange of knowledge and experience. You have got access data with the confirmation of training registration. Prerequisites for the use are Internet access as well as a personal email address.